Color is a powerful decorating tool that can visually expand or contract an area, add the impression of light or depth, warmth or coolness. Paver color selection is an important issue not to be overlooked in outdoor design, because even what you would see as natural tones in paving or retaining walls can actually have a touch of yellow, pink, brown or stone, just as white can be dirty or warm or cool. Try to choose pavers with similar tones for a coordinated effect. Light colors reflect the light and open up an area, whereas darker tones absorb light and make areas appear smaller. When using large expanses of paler colored pavers or retaining wall blocks, break the vista with large scale plantings. Pale tones will visually lift a shady, darker area. Knowing beforehand what effect you are striving for is also crucial in your selection of colors. Should the area to be paved blend in calmly to create a subdued appearance or do you want the area to appear more vivid to jazz up subdued surroundings? Ask your professional to provide you with color samples, spread them out on your premises and “live” with those samples for a period of time to ensure you feel comfortable with them. Latest color trends are leaning towards lighter, natural and neutral colors, bringing to mind connotations of sand, shells and the holiday mode. Outdoor space needs to immediately say ‘tranquility’ and ‘relaxation’ and natural sandy tones certainly give you a head start! The aspect, where the sun hits, how long it stays sunny in that area, how much shade is being cast in that area. Do you want to make that area look larger or smaller? Do you want to create a particular mood, e.g. bright, fresh, exotic, mystery, etc? Are there existing colors that need to stay? Consider existing exterior house walls, the roof, guttering and drain pipes, which you may or may not wish to change color or repaint. When choosing paver colors, select shades that harmonize with the area. Pavers a couple of shades lighter than the color of the house or building do not compete for attention. Gray pavers used with brick houses eliminate the urge many of us have to try to match everything. Use brick pavers with wood or stone houses to add warmth. 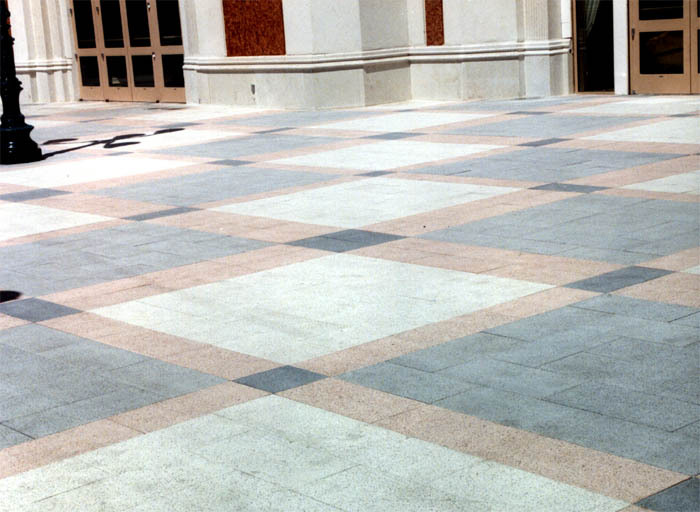 Avoid monotony by combining two colors of paver or use pavers with a blended color. A monotone block is a block consisting of a single, uniform color. It may be red; it may be charcoal, the key factor is that it is one, single, pure color. A monotone is pure and sharp, but shows up even the slightest stain. An all-red pavement will look marvelous until it gets a single oil stain, and then, every time you look at the paving, your eye will zoom in on that one, single, solitary oil-stain, or bird-dropping, or tire mark. 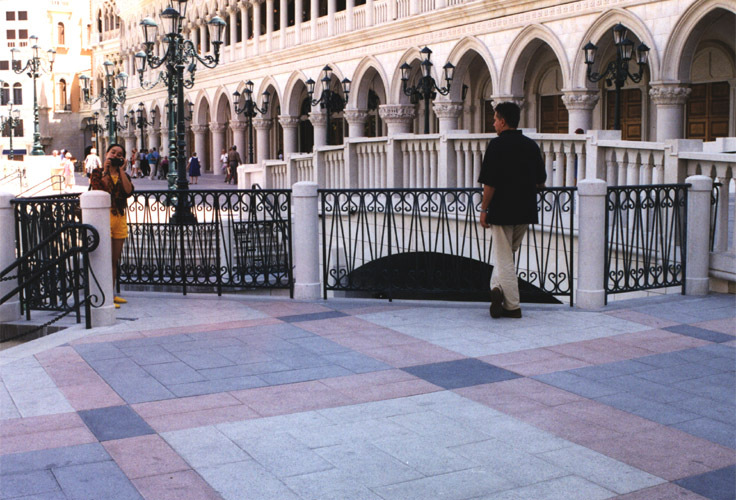 Monotone pavers can be used to provide contrast, they give definition, they emphasize patterning, they fulfil a role within a larger color scheme. A multicolor is, obviously, a block with more than one color. It might be a blend of two, three or more colors. There may be varying amounts of each color within a single block or there may be roughly constant ratios of colors. A multicolored paver blends better with its surroundings. Most minor stains would be completely lost in the multitude of hues and tones. Color mixes can consist of blends of up to four colors that harmonize well together and give a surface an interesting and lively appearance. In choosing a color, make sure that your installer and/or the sales rep of a manufacturer (whoever you prefer to deal with in this matter) shows you a wide selection of colors and provides you with several locations to view the installed colors. Seeing a color on a larger scale, in natural sunlight and shadows, surrounded by landscaping and in combination with colors on adjoining buildings, will give you the best impressions and serve as a good test to challenge or reinforce your instincts. One of the most popular color schemes chosen for residential block paved driveways blends the best characteristics of both monotones and multi colors. A multi colored body with a mono toned soldier edging course. The multicolored paver gives depth and interest and richness while hiding the odd stain or two, and the monotone colored paver provides a frame, a solid definition – a win win solution. Changing the texture of the paver can also add interest. Smooth, rounded surfaces should be used where people are walking, playing or bicycling. Jagged, rough-textured surfaces can be used in areas of less traffic to create an accent or border. The patterns chosen will create the illusions necessary for the look you are trying to achieve.